I apologize for my late response. I’m frantically writing my dissertation right now because my 3-chapter deadline recently got pushed up! Thanks for reading. Your posts really inspired me to be creative this week in approaching the way I think about my dream online course. Thank you all for your inspiration! I am responding to prompt 1: Based on your experience in this certificate sequence, what do you imagine your “dream” online composition course looking like? How would you structure it? What tools would you emphasize? How would you like students to experience learning in your online space? The KonMari method is all about sparking joy. I want my online classroom first and foremost to be an enjoyable system to navigate and a place that students actually want to be. First and foremost, I want to greet them via a welcome video where I take the time to introduce my teaching philosophies, professional goals, and a little about my non-academic identity (just as I do in person). I want to gradually build trust with my students. By putting myself on the spot from the get-go, my hope is that they will also feel encouraged to open up in our online space. The second space that I would like them to be able to click on is an introductions post where they too leave a video/voice/or written introduction. Furthermore, when students log into my online composition course, I want everything they click on to have a very specific purpose. Just like everything has a place that is easily identifiable in The KonMariMethod, I want my course to have as few clicks as possible. That means getting rid of extra file folders and extensions on Canvas that are stored in the navigation system of all stock courses. Like in the KonMariMethod, I don’t just want to tidy up my files; I want to also get rid of a clutter problem caused by too many files. In the past, creating one PDF with every reading and a table of contents has been helpful. I might even think about creating a course reader again for my English 100 course so that students can have something tangible that I created for them. That also means organizing my writing projects by pages and not modules. I envision having one page for every major course project and embedded within that page, a clear sequence of icons to click on for each week. I envision those icons being fun memes that also spark joy when students click on them as well. My schedule is crazy, and I empathize with my students who have crazy schedules. I crave a set plan with a to-do list that I cross out each day. I take great satisfaction in crossing things off my to-do list and seeing to-do list items checked off in other online systems that I have interacted with in the past. When I had some classes on the learning management D2L in the past, I got great satisfaction from seeing the check mark come up after I had downloaded a file and read it or submitted a task. I used that check-mark system religiously to keep up with my work. I want my students to have something similar. I envision a weekly announcement for student’s that is not only color-coded but also has a digital checklist for students (that can also be printed out if they choose). The checklist will also have a section that outlines how much time they will need for a task and which days they may want to complete a particular task on in order to meet weekly deadlines in the class. I envision many weekly tasks being similar and due on Mondays, Wednesdays, and Sundays. Having a steady schedule of deadlines is important for not only my schedule but also for my students to have consistency. In the KonMari Method, those decluttering their homes do so all in one big swoop rather than a little bit each day. I want my students to engage with a variety of different course tools. While I do not use them all at once, I typically like to introduce the tools that they will encounter in our course early on in the class so that they are familiar with the types of activities and work they will be engaging in throughout the class. Then when it comes time for students to use a new tool, such as Zoom for a peer review activity, they are not completely shocked. I currently have a program manual and video tour for my online TESOL education courses that guide students throughout the course. For my OWC, I envision creating a similar program manual and accompanying video that preview different tools used in the course such as Zoom, Google Documents, DraftBack, Discussion Forum posts, uploading images in discussion forum posts in Canvas, Canvas peer review tools, and preferred mechanisms of communication with the teacher on Canvas (I can’t stand it when students send a random message in the message system within an assignment that they uploaded, and I never see it!). Do you have any suggestions for me about that? In the KonMari method, the technique is supposed to foster not just a short-term change but a transformation. I want my class to engage students with developing a growth mindset and a college and literacy success plan that will inspire them to be a better version of their academic selves. In my current English 100 course, I integrate some materials from Carol Dweck’s growth mindset in my first unit. I also integrate some materials about a mindset that stresses critical thinking as well as rhetorical listening/reading strategies. Students do a genre twist project with a 3-page narrative that leads into a 3-page college and literacy success action plan letter to themselves. At the end of my online (and onsite course) students create an online portfolio on Weebly showcasing some of their best writing, their language self-study plan, as well as quotes from their narrative and college and literacy success plan that will continue to guide them through college. By publishing their work, they create a new academic identity that they can come back to in a virtual space. That virtual space is also a place that I hope they will continue to nurture as their professional endeavors takeoff! Keeping this unit in my online classroom is important to me, and I believe that I may even adapt it further in an online classroom where students use Weebly earlier on in the class. A mindset of productivity is key in the OWC. I want to instill in my students that through the writing process they can truly feel more productive and satisfactory about their writing. I model for students my own professional writing techniques and share examples of revision plans that I create for feedback that I receive from journal reviewers and publishers. They then use that same model revision plan for each paper throughout the course. By keeping careful track of major and minor changes that they have made based upon their reviewers (classmates and myself) requests, they begin to see the power that they have in making productive changes to their writing. They also get less stressed about the revision process itself knowing that they have a clear plan to make productive changes that will lead to a better score. I will have OWC update their revision plans in their Google Documents. I will also keep track of how students are doing on their drafts in the online classroom by requesting that they write all of their papers in Google Docs. That way I can do daily monitoring of students that can lead to more interactions with students and solve issues earlier on before they arise. Whereas in the onsite classroom students often bring many short drafts like an introduction or body paragraphs for credit, I can monitor students’ assignment progress in an OWC directly via Google Docs. I had an instructor who interacted with me bi-weekly on my assignments and papers in the past via Google docs, and it was life changing! Week 1: Tools, Tricks, and Transitions: Teaching Online Made Me a Better On-site Teacher! I have to start by telling a story about one of the biggest challenges I have had teaching online thus far in my career. During my second year of teaching online coursework, I was notified that I had a student in my online class that was blind. I had a lot of support available to me to help this student such as getting him Microsoft Word Documents of all of our readings from our text-book and additional readings (his screen reader could only read from black and white MS Word Documents). I eventually solved a huge problem that was preventing him from joining our online discussion forums (I have pictures of modules for students to click on and while the picture was linked the text was not linked and so his screen reader could not pick up the link from the image. Screen readers need to read a text that is linked in order to pick it up and announce to the listener that there is indeed a link.) I e-mailed him MS Word files for the quizzes that were on our LMS Moodle. Each week I had to carefully review all of my materials and make sure that he had access to everything in a format where he could listen to the lecture, have the reading in a Microsoft Word File, and access other student’s discussion forum responses in a timely manner in order to respond to them. I e-mailed this student almost every day in the first 2 weeks of the course. An e-mail was one of the best sources of communication for us at that time since the student reported to me that he was having trouble with a phone line and Internet access at the time. I believe by week 5-6 the student dropped the course. I’d like to say that I did everything that I could have, but I’m sure I could have done more. Long story short, that student got me thinking about how my online courses in English composition would need to get more simplistic looking in nature so that students are not navigating through modules with long lists of files, etc. I currently use texts from a variety of resources and books and the documents can really start to clutter each module. 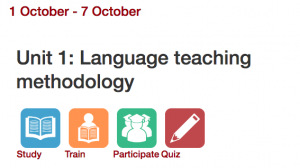 I have a very different looking online course in my teacher education program with Moodle, and each module has just four images to click on with tasks for each week. For my two sections of English 100 this semester, I definitely need to find a way to get rid of all the clutter. I do like how Curry has this course set up with just four pages on the left-hand side, and all of the materials needed for each with stored within the discussion post. What a great way to de-clutter any course in an LMS! Someone with a screen-reader would be able to navigate Curry’s course much more quickly than mine right now! Ok, my response is getting long. I just want to talk about one more aspect from Wood’s presentation that I have been working on in my ENGL 100 courses this semester. Wood’s point about racially salient images was something that I have typically stayed away from. However, I have just recently noticed how many different racially and equitable images and materials I am utilizing in my coursework. To name a few, I use a short activity from Borcher’s Rhetorical Theory: An Introduction where students analyze part of Christopher Reeves speech at the 1996 Democratic National Convention. I have used this speech to help students get more comfortable with the task of analyzing the rhetorical situation in many different workshops and courses I have taught. But I was hesitant this semester to use it because I have one student who uses a wheelchair in my class. I wasn’t sure how this student would react to the short clip of the speech that we watched and the entire speech, which argued for more financial support for disabilities. Anyway, everything went over smoothly. It is always interesting to see who knows Christopher Reeves among my students, and who has ever listened to national convention speeches. I also just recently brought in the Nike ad featuring Colin Kaepernick and demonstrated my own rhetorical analysis of the ad for students before they worked on a practice activity with their own ads they brought in. Curry, since we were talking about that advertisement during the Accelerated Learning Program Conference a few weeks ago you sparked my interest! Racially salient images are more important than ever to utilize in our classes. I’ll end here with one final anecdote. I recently had a student who came to me and said something like, “I just don’t feel like I am smart enough to be here. I’m ______ (race), and I have so much fear and anxiety every time I open my mouth in class. I just get so nervous when I have to talk to other people in class.” This student of mine has been having tremendous attendance issues to say the least, but I have been accommodating him after our chat this semester about his anxiety. What is so devastating to me is that I had no idea that this student was feeling so much anxiety about his race in the classroom. I have a very diverse class. He is in my ENGL 100 ML (Multilingual) section this semester. I never would have expected one of my students to come to me and say something to me about their race making them feel inferior to other students. I am so glad that he did come to me, and I was able to help set up a plan with him so that he is feeling more comfortable in the class. This recent experience has taught me how important it is for me to address my whiteness among my students, and how to talk about inadequacies that students might be feeling in my classes so that they feel more comfortable reaching out for support to me or other resources on campus. This is a challenging topic for me, so I am really looking forward to hearing about some of your own examples with collaborative assignments in your writing courses. Outside of the one example that Warnock shared about his students working on a team project to develop an argument website, he did not share any other group projects in the online classroom. I definitely believe in collaborative learning, but I have become much more wary about developing high-stakes collaborative writing assignments. I have colleagues who do awesome collaborative projects with Wikipedia Editing, and who have their students go through the online student training platform. I have even participated in such a collaborative writing endeavor on Wikipedia with colleagues. However, I am just not brave enough to go there yet in my classes! I largely remain skeptical about high-stakes group writing assignments because of the many students who often complain that one person does most of the work. What I have encountered in the past with group papers or assignments is that students are not truly collaborating, and just end up dividing up their work. I am guilty of “the divide and conquer” phenomenon myself when writing with colleagues. I have more recently convinced my co-author of a few articles to start writing individual paragraphs and sentences alongside me in a Google Document instead of our old way of dividing and conquering (she took the lit review and I took the methodology section on some of our quantitative studies because I was the math person). What I found was that the pieces that we “divided and conquered” were not as powerful as compared to when we truly wrote more collaboratively. We worked much better discussing our writing more intimately in a face-to-face setting when we were sitting next to one another typing away and bouncing ideas off one another. I flew back to Macau one summer so that we could finish writing a project together in-person. Developing collaborative assignments is a complex process. It requires much more than just asking students to jump on a Google Doc and write collaboratively or to respond to their classmates’ ideas in a peer review or discussion forum response. Research supports collaborative learning, but applying it in practice is a challenge! It’s not surprising that I have been influenced by one of my graduate professor’s research on “Cognitive Presence in FYC: Collaborative Learning that Supports Individual Authoring.” Stewart (2018) found that knowledge construction that resulted from collaborative activities in online FYC courses only took place when the instructor emphasized the value of engaging with multiple perspectives. I continue to value Stewart’s recommendations that group cohesion can be better facilitated when instructors “create activities that invite students to work together toward a common goal instead of co-existing in an online space where they work toward individual goals” (Community Building and Collaborative Learning in OWI). Again, creating that activity with the concept of a “common goal” and “engaging with multiple perspectives” is much easier said than done! Thus, I would like to second Stewart’s recommendation that students in OW courses and all online courses for that matter discuss the topic of collaborative learning as part of a specific course goal. Ok, so now I’ll get into the application part of this response! Something that I always do in my on-site courses is a debate related to a reading or topic we are discussing or analyzing. I typically keep the debate as an informal class activity, and I give students plenty of time to prepare for it in class. Students take a position on a topic and move to one side of the classroom to collaborate pieces of evidence from our readings or outside readings that support that position. I typically divide the classroom up into smaller groups of two or three within their position side so that they can have more intimate discussions. Then I ask everyone to stand up and move to opposite sides of the classroom to defend that position. Students can only speak once for their group, and I typically only allow them to speak for thirty seconds to one minute. This goes on for about ten minutes back and forth from each group. Typically, I have students write a response directly after the debate addressing a counterclaim that they heard about during the debate. That piece of writing serves as some type of initial scaffolding for their larger writing assignment (depending on the assignment that they are working on, I’m speaking broadly here—I do this kind of activity in most all of my writing courses regardless of level). If I were to put this in-class activity online, I think it would work nicely as a low-stakes writing assignment for students. I could ask students to present their initial position or analysis via small groups of 4-5 on one side and 4-5 on another side. That way the discussion forum becomes more manageable. Then I can create a second task where students are required to explicitly use another student’s piece of writing within their response. Warnock suggests that if students are working on a critique that they “account for previous posts in their critiques” (p. 149). The same idea holds true for discussion forum responses in my proposed debate task. Students should build on previous posts by actually acknowledging other classmate’s propositions by writing their classmate’s names, and then building upon their ideas. I can’t tell you how many teachers (novice and experienced) struggle with responding to their peer’s ideas my online TESOL education courses. In the first weeks of class, I provide heavy attention and examples of how to integrate a classmate’s ideas into a discussion forum response where students are replying directly to one another. If a student is not using their peer’s names in their response, I almost always send them an e-mail to discuss with them why it is important to include names and why it is important that we collaborate and build on one another’s ideas. I will get students who reply to another peer without writing their classmates name, and who just go on to write about whatever they want to without acknowledging the ideas they are actually responding to. 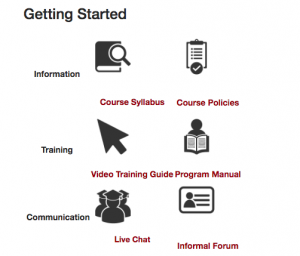 Responding to classmates’ ideas on a forum and extending or adding novel ideas is a process that needs to be taught, modeled, and emphasized within any online course. What I am learning from my reading adventures this week is that collaborative learning is a topic that should be explicitly addressed with students in any online course, and is a concept that should be addressed early on in a course. Finally, I’m a musician, and so much about OWI reminds me of the community of practice that most all musicians are exposed to in some form or another. In my own training, I had to regularly attend and perform in masterclasses. I think the masterclass is a great way to envision the community of practice that I imagine my students interacting in. Tools, Tricks, and Transitions: Teaching Online Made Me a Better On-site Teacher! Hello all! I can’t wait to interact with everyone’s ideas this week! Ever since I started teaching online, I began to change the way that I provide feedback to students in my onsite classes for the better. I truly believe that when you teach online you become a better onsite teacher! I used to provide feedback using Canvas or the Turnitin system in various learning management systems to leave notes in the margins of students’ papers and longer letters to them. Basically, you can leave track changes or comments just as you would in a Google Document in almost any LMS these days. I used to like the Turnitin system many years ago because it had many go-to templates saved that you could easily insert into students’ writing that would also provide them with additional reading, examples, and resources. However, my own beliefs about Turnitin have changed over the past few years that I have formally studied plagiarism, and I no longer use the system to provide feedback. However, I believe that technology has changed my feedback practices and philosophies for the better. Some tools that I have used include typed letters, screencasts, and audio feedback. In my onsite classes, I mostly provide feedback to students in the form of a typed letter that I e-mail to them and ask them to print out along with the scoring rubric. I have a very fast typing speed (I am a pianist and played Mavis Beacon for hours upon hours as a child), and I can provide end or global comments very quickly by typing. As Warnock (2009) explained, students often like typed comments over hand written comments because they might be hard to read. Admittedly, my handwriting is not the best, especially when I am trying to limit the amount of time I spend responding to writing. Students also receive some hand written notes on their drafts, but for the most part I refer to paragraph numbers and pages in my global remarks to them. In my onsite and online courses, I also make an effort at least once in a semester to provide voice comments or screencasts. I do find that leaving voice comments and screencasts takes me longer than typing comments, but I like to expose students to both types of feedback (typed and audio). Then I often let them try both types of feedback with classmates in an online peer review (in onsite and online courses). Voice comments and screencasts take me longer because I still need to think about what I am going to say before I start recording. When I write, I am more easily able to process my ideas. Writing to learn is a writing threshold concept that most everyone can relate to. However much I like typing my feedback, I understand that many students are both auditory and visual learners (as am I). Thus, screencasting is one of the most informative ways to provide feedback to students that I have found. The ability for students to listen to my commentary as they see my cursor moving across their writing mirrors what we would do together in person. I have found that students enjoy using screencasts in online peer reviews, and really value the detailed feedback that they receive. I typically have students use the free version of Screencast-O-Matic to record and upload their screencasts. I also provide a video tutorial about how they can use the free version, and they can see my face down in the corner as I am explaining the tool to them. I know that many of the colleges I teach at offer other screencasting programs in the library for free, but I like students to try out the free version of Screencast-O-Matic so that they might use it again as a resource in the future off campus. By the way, when you use the free version of Screencast-O-Matic and you save your video and try another one the program threatens you that your old video will be deleted if you use the free version again. However, it is a lie. Just click the yes button, and you can use the free version as many times as you like for up to 15-minute videos. There is a small watermark in the corner on the free version, but it in my opinion it is not distracting to students or wider audiences. I attached one of the tutorials I have made in the past at the end of this blog post. When I first began teaching English language teaching certificate courses online, I sent each student a personalized e-mail with feedback on their discussion forum responses during week 2. What I realized from providing such feedback during week 2, was exactly what Warnock (2009) argued when he wrote about the importance of responding to students a lot in the beginning of the course. I find that when I spend plenty of time during the second week providing typed feedback to students I see higher quality writing throughout the course on discussion forums. The same holds true for onsite courses that I teach although I have different weights for discussion forums in online courses as compared to onsite courses. Like Warnock (2009) advocated, I also require much more weekly work on discussion forms in online courses than I do with onsite courses. 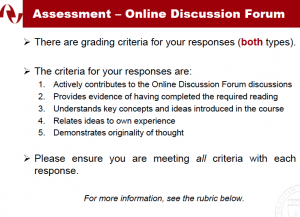 Finally, when I write feedback to students about their discussion forum responses via the form of an e-mail I am very careful to integrate my thoughts about the score by also referring to my scoring rubric. I might say something like the following: You are doing a great job talking about your personal teaching and learning experiences in relation to the question, which meets the criterion 4 and 5 on our scoring rubric. However, I would like you to carefully integrate quotes or paraphrases from our weekly readings and video lecture with page numbers or a time stamp (see my example responses in week 1) in order to meet criterion 2 and 3 on the discussion forum rubric. I’ll share that rubric below so you can see what I am talking about here in more detail. Then I go on to provide an example of what I mean for students so that they can actually see what I mean by connecting to their prior experiences or integrating a source. I most often have students write me back in the same day to ask further questions, or confirm that they have understood my suggestions to them and will try to implement them in the next week. As Warnock (2009) recommended, I then respond to students to always get the “last word” in e-mail conversations. I have found that always having the last word does help to develop a much more robust relationship with students in online and onsite courses. Warnock, S. (2009). Teaching writing online. Urbana, IL: National Council of Teachers of English.